Is Swimming a Strength-Training Exercise? 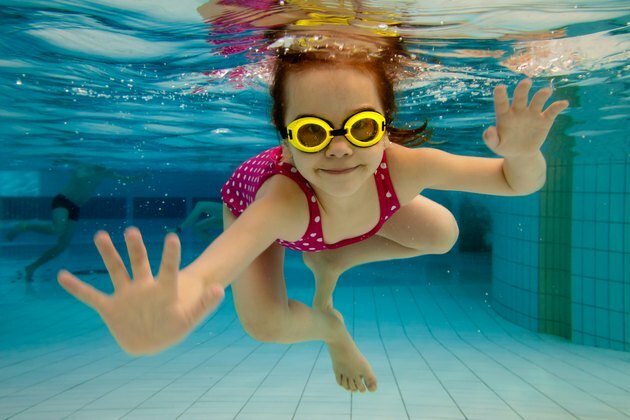 Swimming is an aerobic exercise, according to exercise experts, including Cooper Aerobics Center founder Dr. Kenneth H. Cooper, health textbooks and encyclopedias, and the American College of Sports Medicine. The textbook "An Invitation to Health" defines strength-training exercises as exercises that require "working out against moderate resistance provided by free weights or your body." Pushups and situps are examples of body-resistance exercises. Consult your doctor before beginning any new exercise regimen. "Invitation" author Dianne Hales explained that aerobic exercises are most effective at conditioning your "insides," including your heart and lungs, while strength-training exercises are most effective at conditioning your "outsides," including your arms and legs. In addition, aerobic exercises are continuous exercises that require your heart to beat at its exercise heart rate rather than its resting heart rate for at least a few minutes. Strength-training exercises, on the other hand, are stop-and-start exercises that require rest between exercises. For example, most people don't bench-press or leg-press for a few minutes -- and each exercise requires too much effort for the human body to do so successfully. Instead, most people do several repetitions of the bench press, rest for a minute or so, then do several repetitions of the leg press. Strength-training exercises supplement your aerobic exercises, including swimming, running, bicycling and walking. Building your muscles helps you swim faster and increases how much weight you lose swimming, because muscle burns off calories better than fat. However, you shouldn't do strength-training exercises every day, because "skeletal muscles start to break down when exercised intensely more often than every other day," according to The Merck Manual of Medical Information. The American College of Sports Medicine recommends two or three strength-training sessions per week. The exercises can include weightlifting exercises or body-resistance exercises such as pullups. Each session should include at least eight repetitions of eight different exercises, according to ACSM. Swimming has many benefits. Unlike strength-training exercises, swimming exercises can be done every day, because "the heart can be exercised several times a day every day," according to The Merck Manual of Medical Information. Swimming builds your muscles less than other aerobic exercises, because water limits how much you can move your muscles, but it does give you an opportunity to exercise your entire body, including your arms, back and legs. In addition, swimming is an excellent exercise for improving the flexibility and function of your muscles and the water "protects participants from muscle and bones problems," wrote Cooper. 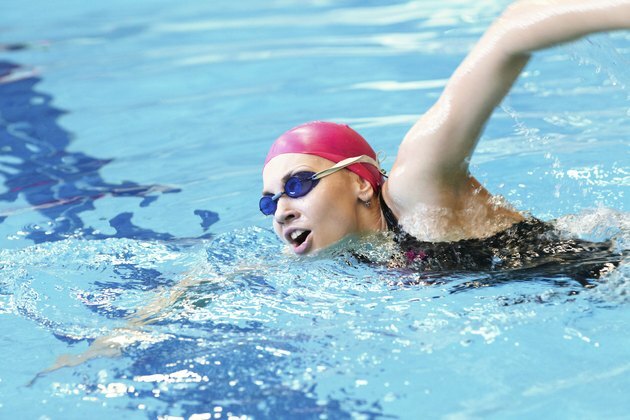 You can improve your fitness via swimming equally as much by swimming each of the four major strokes -- freestyle, backstroke, breaststroke and butterfly. The sidestroke is too easy, wrote Hales. Cooper recommends that healthy but previously sedentary people swim 300 yards four times per week at the beginning of their swimming exercise program. You should increase your distance to 400 yards in the third week and 500 yards in the fifth week. By the 10th week, you should be able to swim 900 yards for all future weeks. Start Strong, Finish Strong: Prescriptions for a Lifetime of Great Health; Kenneth H. Cooper, et al. Is Swimming Good for Cellulite? Does Running or Swimming Burn More Fat? What Are the Benefits of Swimming for Women?